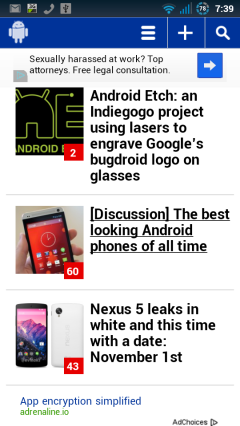 One of the biggest and oldest Android sites, Phandroid, which launched 2007, has a new responsive design. When viewed in a browser with a viewport width less than 800px, the site’s shape shifting custom WordPress template performs a complete visual makeover. The sidebar and desktop ads disappear and the header’s traditional masthead is replaced by a faux-mobile app menu. The transformation all happens on the fly in the browser using front end logic. Phandroid’s content includes reviews, rumors, tips, tricks, and tutorials for Android Phones, Tablets, Apps, Games. 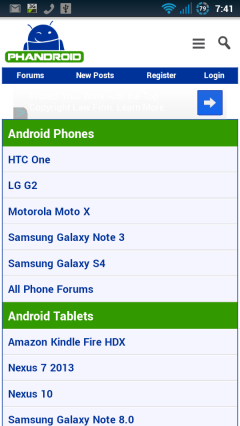 Phandroid is also the home of the AndroidForums, the second largest. after XDA-Developers, Android dev forum. The forum is another responsive web design, powered by a custom vBulletin style. This entry was posted in Android and tagged phonefan site, Site Reviews by Dennis Bournique. Bookmark the permalink. I didn’t know about this. Thanks for letting me know why Phandroid’s been unusable on my phone for the past year, Dennis.